LEAWOOD, KS (January 6, 2015) – CARSTAR Auto Body Repair Experts is happy to welcome CARSTAR North Aurora Collision Center to North America’s largest collision repair network. The shop is located at 1 S. River Rd in North Aurora, IL, and is owned by Brian Gore. Gore has more than 25 years of experience in the collision repair industry and is looking forward to continuing the growth of his business with the help and expertise of North America’s largest multi-shop operator network. "Over the last 25 years, I have owned several body shops and I have seen the industry and insurance companies change. I feel that we can be at our best and serve our community to the best of our abilities by working with CARSTAR," Gore said. CARSTAR North Aurora Collision Center is housed in a 19,800 square foot, state-of-the-art facility. The shop utilizes the CCC ONE® Total Repair Platform for computerized estimating, workflow, repair processes and an improved customer experience. The shop features an AFC Finishing Systems paint booth with heated downdraft, Kansas Jack frame machine, and Miller welding equipment. Technicians are also I-CAR Gold certified. 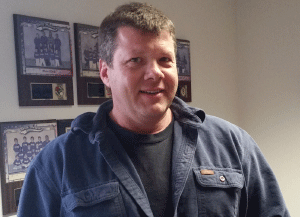 CARSTAR Auto Body Repair Experts is proud to welcome Brian Gore (pictured) and CARSTAR North Aurora Collision Center.